Support independent, investigative journalism. Ya’ heard? I am an abuser of laptops. This morning, when my latest victim’s screen froze in a rainbow ribbon- a final and poignant act of performance art, I knew the cause. I’ve been writing about Louisiana politics for the last nine years, and during those years, I haven’t taken a dime from advertisers. I haven’t sold my mailing lists to third parties. Readers of my website don’t wake up to e-mails from shady businesses selling steroid substitutes or politicians peddling the pending apocalypse. To be sure, like NPR, I’ve tried selling tote bags (To those who bought one and still haven’t received theirs: I’m trying, earnestly, to deliver as many as I can in person, because, it turns out, shipping those bags costs more than I took in). I am both fiercely proud of and deeply humbled by what I have been able to accomplish here on my small pocket of the internet. My laptop wasn’t murdered. It wasn’t defective. It was just exhausted. I’d worked the poor thing to death. During the last six months, together, my laptop and I accomplished some staggering, astonishing things, and I owe my success, entirely, to those who have supported me by listening, by reading, by sharing, and by contributing. In October, I decided to speak out in support of Texas gubernatorial candidate Wendy Davis. She had been under fire for releasing a campaign commercial that featured an empty wheelchair, a reference to Greg Abbott and his stunningly hypocritical record on disability rights. Critics in the Texas and national media accused Davis of attacking Abbott for being disabled. For me, as someone who has lived his entire life with a physical disability, the criticism against Davis was maddening, myopic, and privileged; it completely missed the point. But by so terribly missing the point, it was also revelatory. Greg Abbott, as Attorney General of Texas, had, arguably, the worst record in the entire country on disability rights, but once his opponent dared to reference Abbott’s own disability and his hypocritical record, the media faltered. That’s why I decided to speak out, and in so doing, unwittingly, I became the story. Politics isn’t a game, and anyone who says otherwise is either too lazy or too dumb to realize that sports metaphors are usually poor, convenient substitutes for actual analysis. 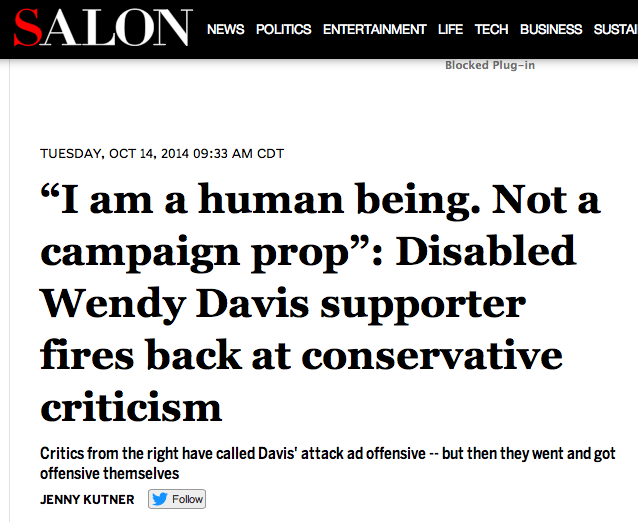 After I spoke out in defense of Wendy Davis, I was attacked- not for what I said, but for how I looked, how I moved. It was the very thing that conservative supporters of Abbott had accused Davis of doing by airing the “empty wheelchair” ad. I was called “a prop” by conservatives. The Washington Free Beacon posted a video clip of the very end of my remarks at a Davis press conference and reported, inaccurately and unethically, that I had been “shamelessly dragged” across the stage (In truth, I had asked for the Davis campaign to slide my chair three feet over after I completed my remarks, and they graciously obliged). Scott McKay of The Hayride, a Louisiana-based blog, joked about me being “crippled,” because, apparently, that is hilarious to folks who trust the political acumen of the guy selling doomsday-prepper frozen dinners that keep for 25 years. I wrote columns and essays about my experience, including a piece in both Salon and The Houston Chronicle. In October, along with Jason Berry of The American Zombie, I broke the story of then-Congressman Bill Cassidy’s questionable employment relationship with LSU. The story made national news and dominated the first, final, and only Senatorial debate between Cassidy and Mary Landrieu, the incumbent challenger. It also resulted in at least two different ethics complaints and an extensive internal investigation at LSU, an investigation that is still ongoing despite Cassidy’s election to the Senate. I coined the nickname “Double Bill,” and had I been smarter, I would have trademarked it before it went viral. In late December, I broke the story of Congressman Steve Scalise attending a white supremacist meeting in 2002. 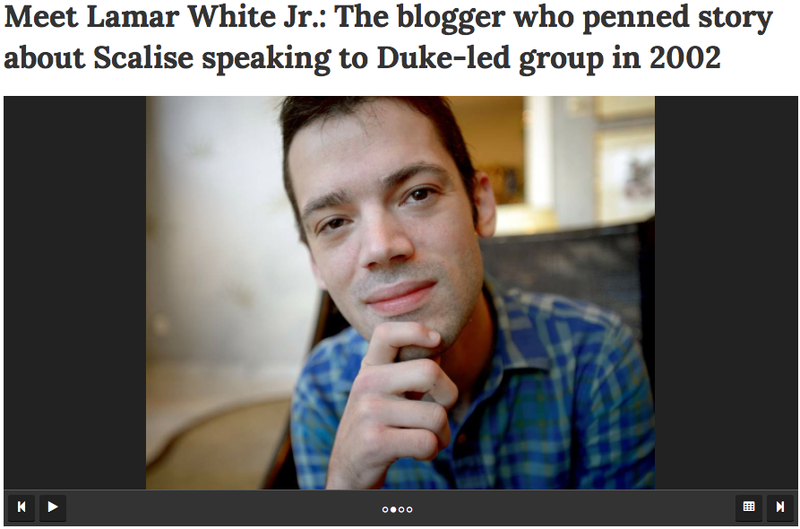 In less than 24 hours, my story had crawled to the top pages of The New York Times, The Washington Post, and, among others, The Wall Street Journal, Huffington Post, Salon, Slate, The Daily Beast, and practically every other news publication in the country. 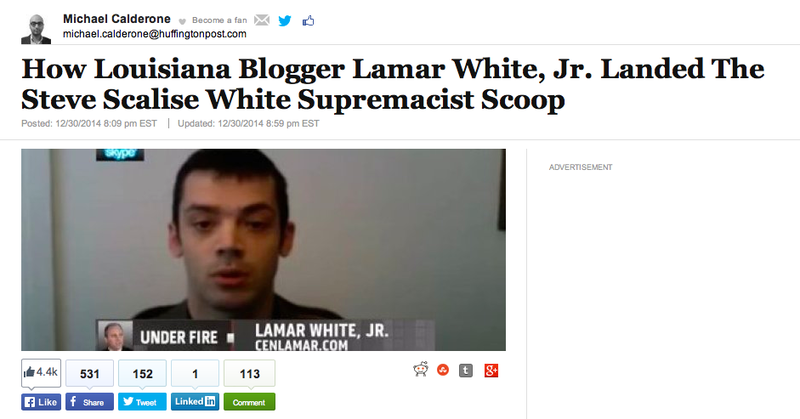 I interviewed on MSBC and on the radio and with The Huffington Post and The Washington Post and The Daily Dot. I somehow earned my own entry in Wikipedia. Again, I am astonished that my stories have become so well-known in such an incredibly short amount of time, and I am honored that so many journalists across the world have respectfully spared a few drops of ink in order to attribute my work in their reporting. I’m also humbled, because, despite all of the intense national coverage of these stories I’ve broken, I’ve only collected around $45 in total donations. First and most obviously, I need to raise enough money to help me upgrade my computer equipment and pay for travel expenses. I aim to raise $15,000 this month, which is less than 30 cents per visitor. I need a new web designer, a new template, a new search database, and, unfortunately, all of these things require money. I’m not ordering additional tote bags, but with your individual donations of between $1,000 – $10,000, you will earn a gilded name plate somewhere on the site. But I want to do something that no one else has done in Louisiana: I want to use my platform to support pioneering non-profit organizations doing good, inspirational work. For every $500 donated by an individual (but on behalf of a quality non-profit), I will contribute a 1,200 word featured essay and attempt to raise at least $1,500. I would rather be paid to work in the service of those dedicated to making Louisiana a better place to live than crawl in the sewers with those who celebrate its failures, even if it requires me to fill out a few more 990s. Others are being paid to raise money for immensely wealthy politicians; their banner ads pollute and discredit the website’s agenda and its values. I need the money too; don’t get me wrong. I am a graduate student, and the money I earn as a freelancer doesn’t pay the bills. But I don’t want to compromise my ethics or my passion. Or send me an e-mail at lamarw at gmail dot com. Limited funds. Made a donation last year, but it wasn’t acknowledged. Keep up the good work, good luck.